Goal is for Moscow to rise in the rankings of international financial centers. The Ministry for Economic Development has decided to ask for outside help to assess how fast Moscow could improve its status as an international financial center (IFC) and become an attractive destination for foreign investors. The ministry intends to announce a tender this September for “identifying opportunities” and developing a “road map” for raising the standing of Russia and its capital city in international financial center rankings. Although the amount that officials are prepared to spend for this purpose has not been disclosed, experts have put it in the ballpark of tens of millions of rubles. According to estimates by British consulting firm Z/Yen Croup, Moscow is currently ranked 65th out of 77 international financial centers. However, Moscow and federal authorities are working on preparations that will hopefully improve their positions in key international rankings. The consulting firm that wins the tender will have the responsibility for identifying the most important IFC rankings, investigating their structure, reviewing the key assessment indicators with the biggest impact on the standings and performing a comparative analysis, said Rostislav Kokorev, deputy director of the Ministry for Economic Development’s corporate governance department. “There are numerous rankings, which are all fairly subjective. In order to compete for higher ratings intelligently, we have to do research, identify individual indicators and see which ones are the most manageable. We want to hire a serious consultant, perhaps an international one, to perform a full-scale study,” the official said. According to Kokorev, any plan for improvement should focus on the key areas for improving the legislation, law enforcement, and business practices required for Russia to gain a higher standing in the rankings, including in such areas as financial markets, the banking, tax, and judicial systems, corporate governance, investment climate, infrastructure and innovative development. The key criteria underlying the IFC rankings include market transparency, the legal framework, enforcement of shareholder rights, and compatibility of the country’s laws with international legal standards, as well as its market capacity and liquidity. “Moscow is at the bottom of the first 100 cities or at the top of the second 100 in most such rankings,” said Alexei Kozlov, Lead Analyst of the UFS Investment Company’s Research and Risk Management Department. 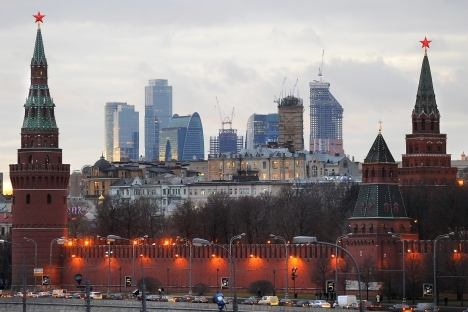 Moscow’s position in the rankings relative to other international financial centers is due in part to the rapid development of rival cities, explained Mikhail Pryadilnikov, head of the division for coordinating Moscow’s Economic Policy and Development. According to the PricewaterhouseCoopers (PwC) ranking, which placed Moscow 21st out of 26 in 2011, the Russian capital lags behind its rivals in the quality of its environment (a category that includes healthcare, public safety and the quality of its institutions). “This is an important indicator for assessing the city’s government. At the same time, international experts rate Moscow’s economic potential among the highest,” Pryadilnikov said. According to TKB Capital analyst Sergei Karykhalin, Russia’s key problems include “lack of protection for property rights, corruption, frequent and unpredictable changes to the legislation, a poorly developed financial system, and the low liquidity of its capital market.” One of the rankings proves him right. For instance, Transparency International’s Corruption Perceptions Index ranks Moscow 143rd out of 183. “Investors are afraid of risks they cannot hedge against. Without any doubt, a law on public-private partnership would mean substantial progress in terms of protecting investors’ interests,” said Ekaterina Shapochka, PwC Russia’s managing director of Government and Public Sector Services. She said Russia should focus on ratings that investors and the global financial community use as guidance, such as The Global Financial Centers Index, the Xinhua-Dow Jones IFC Development Index, and The Financial Times’ The Banker. This article can be read in the original Russian in RBC Daily.